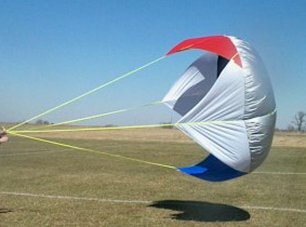 With over a year spent in the design and testing phase, the SkyAngle CERT-3 series was the result of numerous requests from our customers and dealers for larger capacity parachutes and a heavy-duty 24" Drogue. Much more than just a bigger version of the popular SkyAngle Classic, the CERT-3 has been engineered from the ground up specifically for the advanced rocketry flyer with large and/or complex projects. They sport four (4) 5/8" mil-spec suspension lines (2,250 lbs. ), a 1,500 lb. swivel and zero-porosity 1.9 oz balloon cloth. Like all SkyAngle parachutes, the CERT-3 line has been subjected to a battery of professionally performed tests to determine accurate recovery capacity and descent rates. This is the chute you want to pack when only the best will do for the BIG ONES! *As tested by the Parks College Parachute Research Group. Values are load ranges to achieve a 17 - 25 fps descent rate. Actual performance can vary depending upon flight conditions and from product to product. Descent rates are normalized for sea level. Measurements may be nominal. Prices, specifications, and materials are subject to change without notice. 5/8" mil-spec tubular nylon (2,250 lbs.) suspension lines sewn around outside canopy. CERT-3 series manufactured with zero-porosity 1.9 oz. silicone-coated balloon cloth. UV-resistant polyester sail-makers thread used throughout. 3/4" Welded ring sewn at canopy apex for optional pilot chute attachment. See our Packing Volume Table (99K PDF file) for specific pack volumes by tube size. See our Descent Rate Table (42K PDF file) for info on how to select the proper size for your project, or go directly to Jordan Hillers SkyAngle-specific Descent Rate Calculator. CERT-3 series lines attach to a heavy-duty 1,500 lb. 12/0 nickel-plated swivel. SkyAngles resist the flopping, pulsation and canopy collapse often seen in other chutes.